So I’ve decided to put the answer in writing. This article will address the TIME factor as it applies to the Healing FUSION therapy, which is my area of expertise, but I am pretty sure that the same principle can be extended to energy healing practice in general. Before we jump to the “how to” part though let’s make sure we are all on the same page with regards to how the Healing FUSION therapy views the disease process in the body. If you clearly understand the “why”, the “how to” part is easy. Healing FUSION therapy with SCENAR, COSMODIC, QLaser, and/or SOLARIS Blanket is a holistic practice. And as such, it views disease not as an enemy or something alien in the body that needs to be killed, but rather as a very natural and necessary for the growth and development process that trains the body to survive in its ever-changing and often hostile environment. Just as in the famous expression “Love your disease, it’s keeping you healthy”. Furthermore, dis-ease in Healing FUSION therapy is viewed as an inadequate adaptive reaction of the body. Any living system responds (adapts) to the ever changing outside world striving to keep the constancy of its internal environment (homeostasis) and the state of COHERENCE, which means HEALTH. 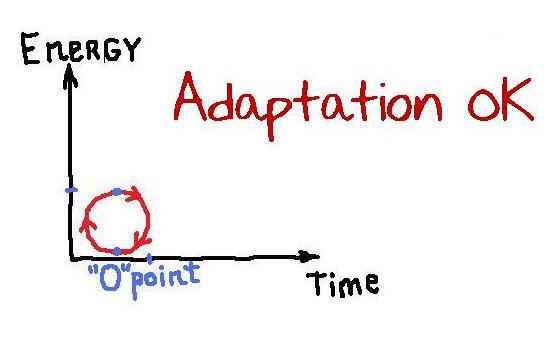 We live in a challenging environment, and adaptation is not always easy. Yet, we are powerful self-controlling and self-regulating systems; we manage. We adapt – and grow and mature in the process. 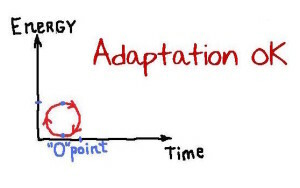 When one cycle of adaptation (adaptive reaction) gets completed, the program disintegrates – and we move on, ready to meet another challenge with all our strength. In a well-tuned healthy body adaptive reactions are instant and unnoticeable, with spending minimum time and energy on completing the quick cycle that starts and ends at “0” point (Fig. A). However, if adaptive reactions, due to a disorder in self-regulation, do not have an adequate measure of reaction, we experience dis-ease, or uneasiness to adapt. Inadequacy of adaptive mechanisms in most cases is caused by improper work of the body programs. If there is a delay in the transmission of information within the body, the adaptive reaction will be difficult and, therefore, slow. Each step of the adaptive program will take MORE time and MORE energy (a larger cycle), thus becoming quite perceivable. We call it “symptoms”. As a rule, the slower the adaptive reaction, the stronger the symptoms. If dis-ease occurs, there are usually two main scenarios. 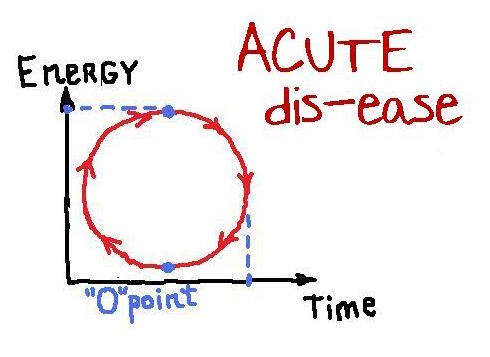 In many situations, the body will still be able to finalize the adaptive reaction and bring it to the “0” point of the cycle in the process of recovery from an ACUTE disease (Fig. B). It will take some time and effort and going through unpleasant symptoms, but the disease will live its life through and its program will be gone from the body for good. Sometimes, however, if the body’s energo-informational matrix is seriously damaged, the adaptive reaction cannot be completed at all (Fig. C). That’s the CHRONIC disease scenario. The body is stuck somewhere on a healing cycle at a ‘dead point’, which it cannot pass no matter how often and how hard it tries (and it usually tries whenever it has a little more energy – we call it a relapse). No matter what the scenario though what logically follows from the above is that instead of fighting disease, as biomedicine does, WE SHOULD HELP DIS-EASE. Help the body complete its adaptive reaction in the most efficient way possible – and the dis-ease will be no more, because there is no more need for it. The program is completed. That’s what we do with our amazing devices. We are going with a client step-by-step through the entire cycle of his/her disease speeding up adaptive reactions every chance you have, until the disease program is completed. Now we should be clear on the “Why” and ready for the “How”. The TIME factor: exactly how long and how often should we treat in order to push forward adaptation without overwhelming the system? Let’s look at the two scenarios again, because the approaches will be different. 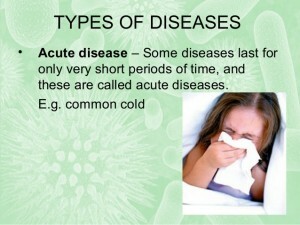 ACUTE disease. The system is alert, mobilized, and focused on solving the problem. It is doing the job – so let’s help it. In this situation, there is no limit on how long or how often you should treat; the longer the better, the more often the better. 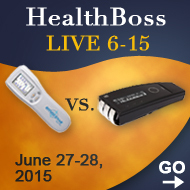 You are working WITH the system, and the quicker it will go through the disease cycle the better. 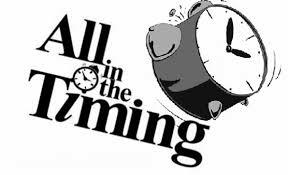 As a “rule of thumb” we say, in acute situation treat every two hours (even if only for 5-10 min.) or as symptoms come back. In some circumstances, however, you may even do non-stop treatments (for example, with a frostbite or a fresh stroke, where the first 24 hours are critical). You really have to follow “the more often the better” rule dealing with a cold or a flu. If you give the already activated immune system an additional boost and then leave till the next day that will aggravate the symptoms (you are strengthening the adaptive reaction). You need to keep moving the cycle forward a step each session, in order to move through it as fast as possible. That way you will be done in two-three days instead of a week. 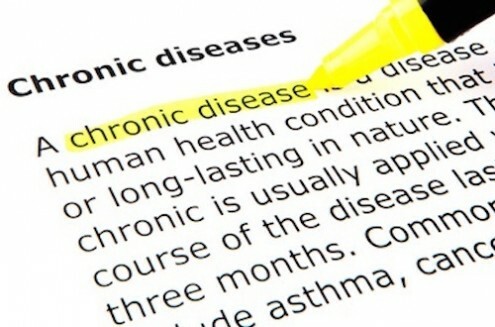 CHRONIC disease. That’s a different story. 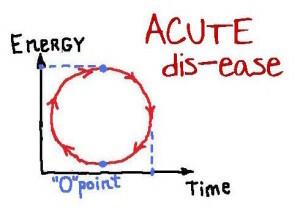 If you are starting your therapy during a relapse (the best way to deal with a chronic disease, because the body’s attention is on it), you can apply the acute disease strategy. It will just be a bit different dynamics of the process requiring a longer treatment course, but “the more the better” rule still applies. 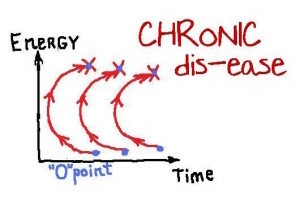 If you help the body when it is in the relapse, it has a good chance of passing through the “dead point” of the cycle and finishing the disease program. It is important to remember though that with chronic processes this one time may not be enough. The chronic disease program is deeply rooted and engraved into the body’s cellular memory and has a strong representation in the central nervous system. It will take several cycles to ‘retrain’ the body for dealing with this particular issue before the body can erase it from the memory. 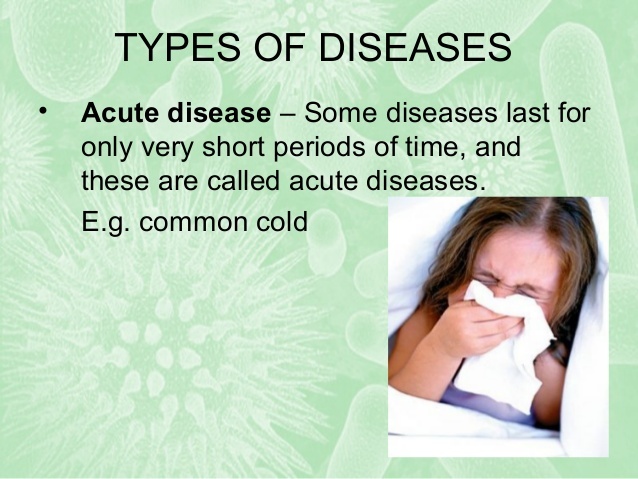 The body can run these disease cycles several times during the same treatment course. How many cycles? It differs. Just imagine a sportsman who is learning to break a bad habit affecting his performance – how many attempts is it going to take? It depends on the sportsman and on the habit he is trying to break, right? It is the same with the body. The good news is, every attempt will be easier and easier and take less and less time (for the same exact cycle) – and then, if there is enough patience and determination, it will all be over. And what if you decide to deal with a chronic problem when the body is not in a relapse, when the disease is dormant? Dormant processes usually display weak symptoms, because they are not the body’s priority and are not being paid attention to. That also means that you will have to first convince the body to change its priorities – and when it finally does, you will have to deal with “it gets worse before it gets better” situation (which we call “the healing crisis”). 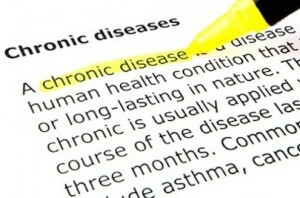 Therefore, there are usually two stages in a treatment of dormant chronic disorders. On the first stage you just waking the body up, making sure it recognizes the problem and accumulates and allocates enough energy to deal with it. Then you wait a bit before starting the second stage, to give the body time to grow stronger. On the second stage, you jump-start the healing cycle and help the body to follow through, just like in an acute situation. How you time your sessions during the course of therapy is very individual, but we usually do not recommend pushing the body too hard during the first phase to avoid a severe healing crisis. 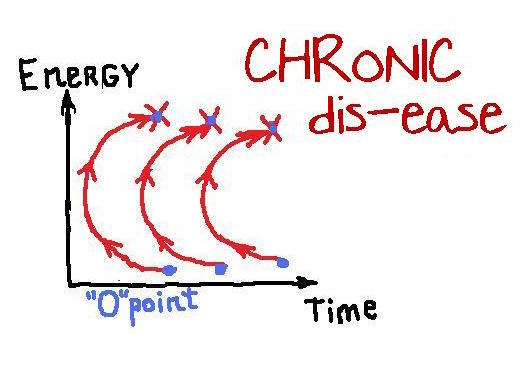 The crisis itself, of course, is unavoidable, because the body HAS to pass through the critical point in the cycle of the disease development, but it can be more or less intense depending on the way you time your sessions and the devices/modalities you use (for example, COSMODIC moves you through a critical point very smoothly while SCENAR can cause a bit of a trouble). The “rule of thumb” here is as follows. Keep your sessions under 45 min. Schedule your first treatment course like this: three sessions a week for the first two weeks, then two sessions a week for the next three weeks, and then just once a week for maintenance until a stable condition is achieved. If a healing crisis develops (usually around 3th-5th session, but that varies), treat like an acute condition until it passes – and then go back to the above schedule. Sometimes clients complain that the schedule is too tight. Unfortunately, that what needs to be done, if they want a result. We explain it to them this way. Imagine a big rusty wheel that you need to make running smoothly. That’s your healing cycle. You apply a strong push – and the wheel moves a bit; that’s your first session. Now, if you step aside and don’t do anything else, the wheel will roll back due to inertia, and you have to start all over again. If, however, if you push it again just at the end of the first roll, it will keep rolling, and as it accumulates momentum, you won’t need to push it as strong or as often. And eventually, it will just roll on its own. That’s why our sessions need to be timed that way. 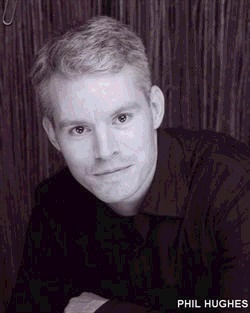 I hope my explanation of the TIME factor in energy healing was helpful and now you not only know how long and how often to treat, but also understand what our recommendations are based on – and can deviate from them, if that makes sense 🙂 After all, everything in energy healing is relative and dynamic, like HEALTH itself. P.S. Please feel free to comment on the article in the Comments box below. I value your feedback. My son has a Q1000NG, Scenar/Cosmotic AG, and a Solaris blanket. He has 11 herniated discs, drop foot, but the main problem is he is chronically EXHAUSTED. He simply cannot sleep, and no matter how much “rest” he gets, he remains exhausted. Is there a protocol you could recommend to help his chronic exhaustion, using any/all of the above. He is just SO TIRED ALL THE TIME, and doesn’t know what to do. I am very sorry about Aaron. I know how bad his condition is and how much he must be suffering. The chronic exhaustion though is not a separate problem; it is most likely the result of Aaron being in chronic pain and, especially, of sleep deprivation. 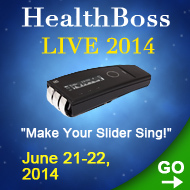 He is in chronic stress all the time and that affects his sleep, which, in turn, drains his energy. Are you and Aaron doing the ANS Balancing Protocol? The description and the video here: http://healthboss.org/blog/2015/12/27/chronic-stress-protocol/. That will not directly affect the level of pain (as you know, that requires different placement of the devices), but will help with his sleep and the stress level over time, if done regularly (preferably daily). Excellent, article , thank you so much. How often and how long do you use the solaris blanket on accute situations and in chronic health problems? Practically, we are seldom that precise. It takes, on average, 15-20 min. in the Blanket to move the system from one state of adaptivity to another. So in the case of a chronic disease the duration of the procedure will depend on the current adaptive reaction and the one you want to end up with (they go in cycles: training – mild activation – strong activation – stress – training etc.) On average, we give a client 35-40 min. in the Blanket, thus moving the reactions two “steps” forward, unless the client is in mild activation – then we do 15-20 min., so that the client does not end up in stress. As per the frequency of sessions, we do it every time we see the client – or, if possible, every day once a day. As per the acute conditions, the initial state is most likely stress – hence, the duration of the Blanket session can be anywhere from 15-20 min. to 45-60 min., usually twice a day.